Use quotation marks (e.g. "breast cancer") to search by that exact term or phrase, no variations. Use multiple keywords separated by spaces (e.g. kidney renal) for broader search results. This search will retrieve items that correspond to any of those words, ranking higher those with all or most of the keywords. Plurals and other variations are automatically included. Breast cancer invades normal tissues and establishes new centers of growth. 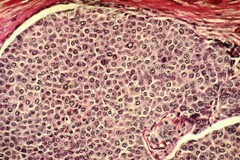 Note that the duct on inside of breast is completely filled with tumor cells. This histological slide, stained with H&E stain and magnified to 100x. None - This image is in the public domain and can be freely reused. Please credit the source and, where possible, the creator listed above.